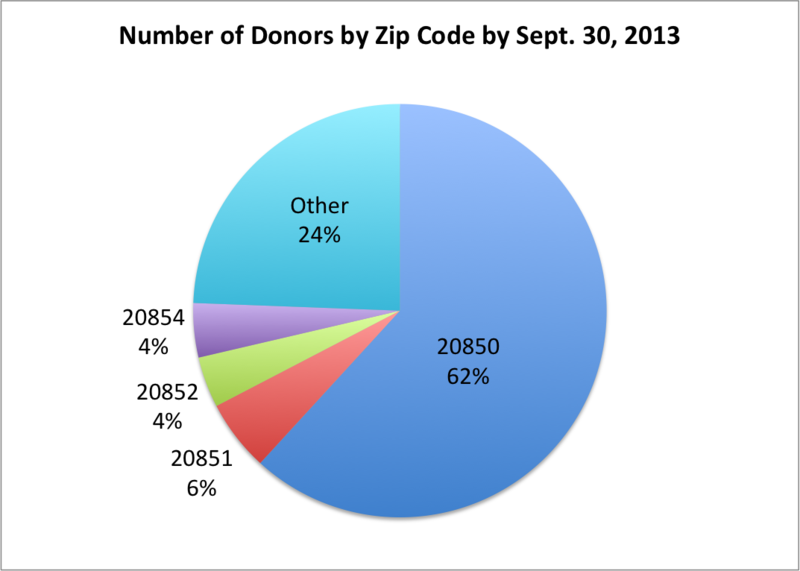 The first campaign finance reports for the Rockville Mayor and Council elections for the period ending September30, 2013 were recently submitted and they reveal that Zip Code 20850 (includes Fallsgrove, West End, New Mark Commons, East Rockville, Lincoln Park, College Gardens, King Farm) provides more than 60 percent of the funds, with other Rockville Zip Codes 20851 (Twinbrook), 20852 (Hungerford, Montrose, North Farm), and 20854 (Horizon Hill, Fallsmead, Potomac Woods) falling far in the distance with an average of 5 percent. That roughly mimics the voting records for those regions and perhaps how much they feel engaged with the larger Rockville community. For individual campaigns, the breakdown varies considerably and can signal how much a candidate has engaged with or is subject to influence by a particular neighborhood. New candidates often have to rely on support from themselves, family, or friends and that’s the pattern seen with Hadley, Palakovich Carr, and Whittaker. Feinberg, on the other hand, has been able to obtain more than 95 percent of her supporters within Rockville, an impressive achievement for an experienced candidate and extraordinary for a newcomer. The mayoral candidates of Newton and Pierzchala, both current councilmembers, are relying heavily on residents within 20850 and from outsiders–donors outside of Rockville exceed 25 percent for both candidates. Feinberg and Palakovich Carr have gathered the broadest representation of supporters across Rockville’s four zip codes. 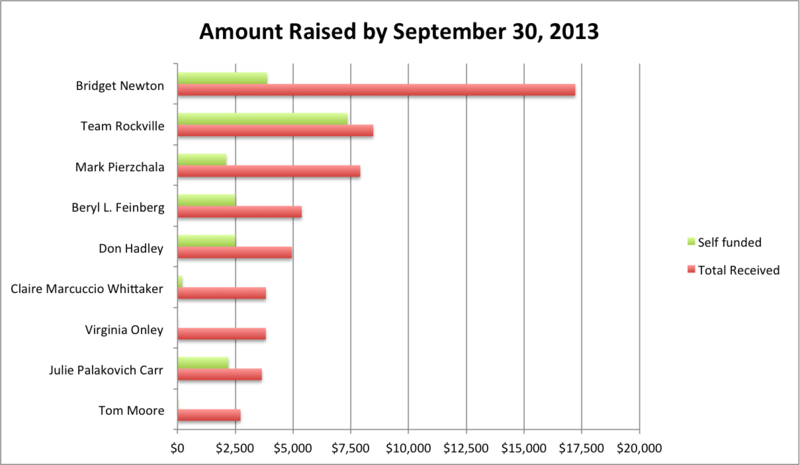 The number of donors seems to fall in three groups. 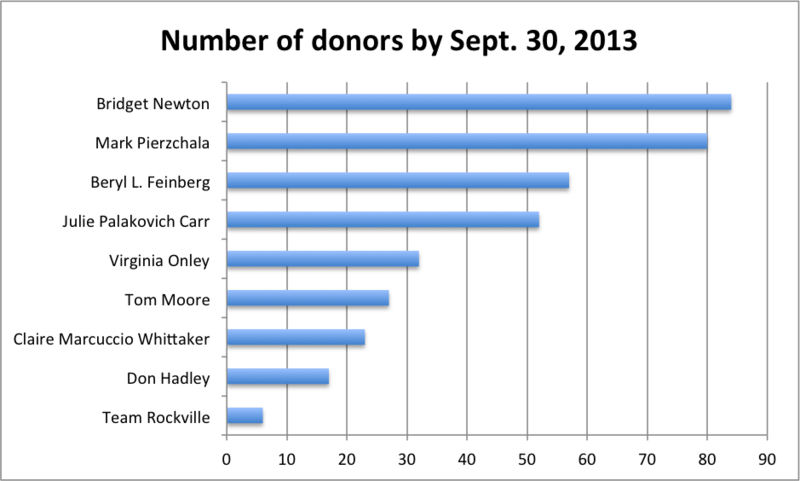 Newtown and Pierzchala lead with about 80 supporters each, Feinberg and Palakovich Carr in the second batch with about 55 donors each, and the remaining candidates with 15-35 donors making up the third grouping. Out of 60,000 residents and 6,000 registered voters, it is obvious that local elections generate serious attention from a very small number of people. For this first round of campaign reports, fewer than 400 individual donations were received in total and many were gifts from one person to several campaigns, so I estimate that less than one percent of Rockville’s citizenry is significantly engaged in its governance. You can either view this as welcome news because one person can wield tremendous influence on the city or disturbing news considering how much influence local government has on the daily lives of its residents and businesses. Virginia Onley: $500 Law offices of Patrick J. Smith & Assocs. In Rockville, the campaign fund reports are required but are not reviewed or audited by the City or any committee, such as the Board of Supervisors of Elections. No one verifies their accuracy or completeness. They are simply accepted by the City Clerk’s office and posted online. Citizens are expected to analyze the reports by themselves and draw their own conclusions. My analysis provides an introductory overview to the money involved in the current election. I encourage you to examine the campaign reports to determine if candidates are honest and fair or subject to undue influence by a certain faction or interest. I’ve already discovered that the forms contain a calculation error that double-counts in-kind contributions under expenses. That must have driven some campaign treasurers crazy. As a result, the expenses reported are unreliable and not consistent with each other because campaigns handled this problem differently (compare the reports for Pierzchala, Team Rockville, and Hadley as examples). Secondly, some reports are incomplete or missing information: Beryl Feinberg and Don Hadley are both missing Schedule IB although they received in-kind donations; several addresses for Bridget Newton’s contributors are incomplete; and the page detailing contributions to Claire Whitaker from another campaign is missing (it was written on the back of a page and only the fronts are scanned). I’ve reported these errors and omissions to the City Clerk and I’m sure all of them are simply oversights and are not intended to confuse or hide anything. You may find other issues, so share them with the City Clerk and post them here so others can have a look as well. Having run for Council previously, I was happy to share my financial records but found the reports to be more complex than an IRS Form 1040. Despite numerous complaints to improve and simplify the campaign fund reports in the last election, it looks like there’s still work to be done. NOTE for 10/7/2013: To avoid confusion between number of donors (e.g., there are ten donors) and dollar amount of donations (e.g., they gave $1000), I’ve retitled the first two tables since the original posting. I’m relatively new to Rockville and I was wondering if there was any discussion in the past about council members representing districts instead of being at-large. There seems to be a lot of discussion about parts of Rockville being under-represented on the council and it says strange to me that there’s no one person I can call with with an issue. I’d love to hear your thoughts on this issue. There has been talk about dividing the city into council districts to ensure a diversity of representation, but it hasn’t gone very far. My sense is that people value diversity on Council but would like to make their own choices about what that means for them (e.g., neighborhood, age, gender, ethnicity, experience, personality). In the current election, you’ll hear a candidate for Council say he’s in the race to add diversity but when I look at him, I see an older, affluent, white male from a politically-dominant neighborhood, which doesn’t add to any diversity in my opinion. I think he means to say he’s providing an alternative or another choice, but he could believe he’s adding diversity (I just don’t know what it is). As for calling someone with an issue, I send messages about city-wide issues to mayorandcouncil@rockvillemd.gov (which goes to each of them plus the city manager) but for specific or neighborhood issues, I’ve had very good experiences with the Neighborhood Resources Coordinators (http://www.rockvillemd.gov/index.aspx?nid=146) who either know the answer or can point me in the right direction pretty quickly. This is a program that’s been threatened with elimination from time to time to save money, so if they’ve been helpful to you, mention it to the City Council and City Manager.